Here you can find most of the Shimano Deore range of disc brakes and ancillaries including the brake sets themselves and lever systems for different applications. 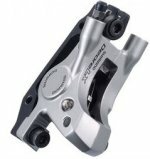 There are both hydraulic and mechanical disc brake systems available. Check the different model numbers to find the right brake for your own use. Some hydraulic Deore system calipers are designed for use with Mineral oil which is non-corrosive and less hazardous than conventional hydraulic fluid.